(CNN) - The vast majority of Americans say Vladimir Putin's not honest or trustworthy, but according to a new national poll they don't compare the Russian president's actions in Ukraine with the land grabs in the years leading up to World War II by Germany's Adolf Hitler. A Quinnipiac University survey released Wednesday indicates that only 24% of the public equates Putin's annexing last month of neighboring Ukraine's Crimea peninsula with Hitler's actions, with 51% saying that's too strong a comparison. Just over one in five admitted they don't know enough about pre-Second World War history to answer the question. Early last month in at a fundraiser in Long Beach, California, former Secretary of State Hillary Clinton compared Putin's military intervention in Crimean to Hitler's European aggression ahead of World War II. "Now if this sounds familiar, it's what Hitler did back in the 30s," Clinton said according to the Long Beach Press-Telegram, which had a reporter in the room for the closed event. A day later, after her comments sparked some controversy, Clinton told an audience in nearby Los Angeles that her comments from the previous day were an attempt for "people to have a little historic perspective." "I'm not making a comparison certainly, but I am recommending that we perhaps can learn from this tactic that has been used before," said Clinton. "What I said yesterday is that the claims by President Putin and other Russians that they had to go into Crimea and maybe further into eastern Ukraine because they had to protect the Russian minorities ... is reminiscent of claims that were made back in the 1930s when Germany under the Nazis kept talking about how they had to protect German minorities in Poland, in Czechoslovakia and elsewhere throughout Europe." In what has become the biggest East-West confrontation since the Cold War, the United States and European Union imposed visa bans and asset freezes on some of President Putin's closest political and business allies. Russia responded with its own list of sanctions against a number of U.S. lawmakers and officials. And the G7 group of leading industrialized countries condemned both the Crimean vote to secede and Russia's annexation of Crimea, which was an autonomous region of Ukraine with a large pro-Russian population. Moscow was also excluded from what was the G8. According to the Quinnipiac poll, 80% of Americans say that Putin's not honest and trustworthy. And a third questioned say the Russian president's not mentally stable, with 48% saying he is mentally stable. But a majority (57%) says that Putin has strong leadership qualities. The poll's release came on the same day that NATO's military chief warned that Russian troops could begin moving on Ukraine within 12 hours of being given an order. 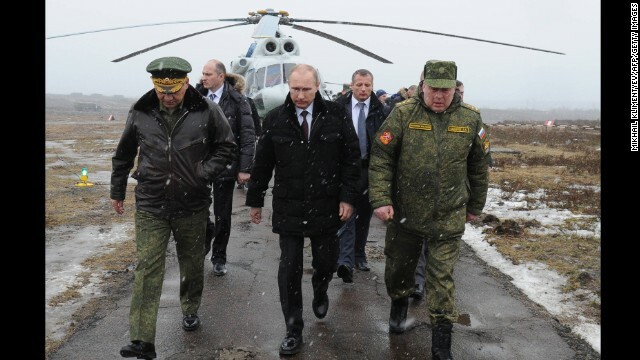 Gen. Philip Breedlove, NATO's supreme allied commander Europe, also told CNN's Christiane Amanpour that with 40,000 troops massed near the border, Russia has all the components necessary to move on Ukraine. According to the survey, 80% of American voters are "very concerned" or "somewhat concerned" that the Ukraine crisis could lead to a larger regional conflict with U.S. military involvement. The Quinnipiac University poll was conducted March 26-31, with 1,578 registered voters nationwide questioned by telephone. The survey's overall sampling error is plus or minus 2.5 percentage points.